Advance Reports Are For Losers. Yes, I said it, advance reports are for losers. Those advertisers who are obsessed with acquiring or building advance media or performance reports either have no clue what they're doing or are just giving in to the latest hype. Technology providers continue to roll out new advance reports as additional dimensions of competition, features that will distinguish them from other technology providers, though these reports provide little if any true incremental value to advertisers. The only reporting metrics an effective advertiser will ever need to review are cost, impressions, clicks, and conversion (CPA and CPC can be easily derived). Any other metric is statistical noise that will only distract you from what is really important, acquiring and retaining customers. Quite often I will be asked to help an advertiser or agency scope out some new advance report that combines their data in a way that has never been done before. Invariably I will ask the client why, what's the purpose of this report. The answer, 80% of the time, comes from the belief that the new report will help them optimize the performance of their campaigns. Those advertisers for whatever reason believe in the notion of audience consistency, the idea that at any given point in time the audience of a website is relatively homogenous and behaviorally consistent with all other points in time. This notion is the bedrock of current online media buying and the guiding light behind audience aggregation. However, a close look at the empirical performance of any online advertising campaign will completely disprove this belief. If you run the same campaign, with the exact same ads, on the same site for the same length of time at two different periods you will see two completely different rates of performance. The audience of a website, their affinity, behavior, and propensity to convert is extremely fickle and changes from day to day without warning or visible cause. Using an advance report to optimize your online advertising campaign is like driving along a winding mountain road while looking out the rear window. In short, it's a recipe for failure. Advertisers need to be forward looking when it comes to designing their advertising campaigns and leave history to the historians. Stop shuffling those silly spreadsheets that nobody can understand. Focus on what you know about a user, an individual, and not what you know about an entire site. Individual behavior doesn't change much. What a person likes and wants stays relatively consistent across time even though the sites they visit don't. Get rid of the practice of audience aggregation and denounce the notion of audience consistency. Target ads to users based on their expressed behaviors and make sure those ads are as relevant as possible, something that I’ve preached about tirelessly in the past. Focus on the inputs to your advertising campaigns because those are what decide its faith. Campaign optimization should be about changing the target profiles of your campaign, adjusting the individual users who you are targeting, or adding more behavioral data to your current profiles. It should be about trying new creative variations with your profiles to get a better understanding of what resonates. If the performance isn’t what you would like then get more profile data. Build and nurture a better understanding of your prospects and manage your relationship with them. 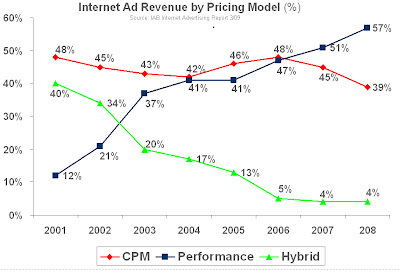 Technologically this is no simple task but then winning at online display advertising may never be simple. Advertising is about relevance, period. The more relevant your ad is to the consumer the more impactful it will be and the greater your aggregate return. No amount of creative genius, cutting edge ad format, or dynamic interaction can save an ad campaign from poor relevance. Search marketing, a $15 billion business in the US which dwarfs display's $8 billion, is completely based on relevance. 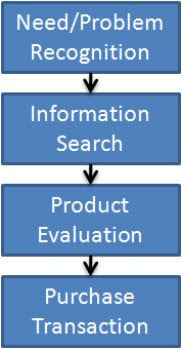 When a user searches for something online they are both interested in the product or service and are currently seeking information. Search marketing allows advertisers to place themselves at an early stage of the consumer purchase decision process with a highly relevant message so they may influence the buying decision. Display advertising technology providers, however, have played primarily in the branding and awareness arenas and have only made halfhearted attempts at providing greater relevance to their customers. As a result most display ads are scatter shot attempts at making consumers aware of a need which they didn't know they had. The issue with this approach is that advertising ROI is sure to be low since your ads are by default poorly targeted and irrelevant to most people who encounter them. This approach has been the cornerstone of display advertising despite the enormous potention of the channel to have greater reach than search and place advertisers further down the purchase decision process. Thankfully recent trends in display marketing are taking the industry squarely in the direction of relevance, something that will eventually allow it to grow much larger than search. 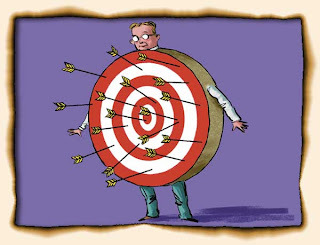 Media buying and targeting for online display ads is built on the principle of audience aggregation. A media planner will make media buys on sites that they believe has an audience with a high propensity to respond to an ad. These audience characteristics are often self-reported by sites or inferred by the site's content. The planner will then combine multiple sites that they think have the same audience affinity into their media plan depending on whether they're going for reach or saturation. The problem with this approach is that relevance is an individual property, on aggregate it diminishes exponentially. So while an ad may be highly relevant to part of a site's audience, when delivered to the entire audience its overall relevance becomes marginal. If an advertiser is lucky their ad will make it to the segment of the site's audience that it is most relevant to, however since they're paying for all impressions of the ad their ROI is bound to suffer. To make things worse the structure of most third party ad delivery systems is also built around this audience aggregation model. These systems care very little about the individual characteristics of a single user on a site nor do they easily allow an advertiser to leverage those characteristics in a meaningful way. Unfortunately there is very little alternative purchasing and delivery mechanisms available to an advertiser, at least nothing that is easy to understand and execute. This is the first hurdle to increasing relevance within the online display media channel. There have been relatively recent attempts at solving this aggregation problem. Yahoo's RightMedia which launched in 2005 started the trend towards display ad exchanges where advertisers and publishers can buy and sell ad inventory on an impression basis. While this idea was novel and certainly in the direction that display needs to go the execution, i.e. setup and payment resolution, was tedious and cumbersome. DoubleClick's AdExchange which launched in 2007 took the exchange model one evolutionary step forward by providing payment clearing services and a more automated, streamlined transasction process. These exchanges will serve as the foundation for the display advertising industry in the future, but before they can get there they must imrove their interconnectivity and interoperability. Ad exchanges need to make it easy and seamless for publisher to sell inventory, which entails integrating with the various major publisher systems. They also need to make the buying and execution process as painless and data-driven as possible for advetisers and agencies, otherwise the buyers simply would not come. To succeed, these systems must be open to accepting invetory and bids from any other third party advertising systems in real-time. A feat which none have been able to accomplish to date. Media buying and delivery on an impression basis en masse is only half of the relevance equation. The other half, which rarely gets any attention at all, is about building enough knowledge about individual consumers to make your ad relevant to them. Part of the reason why this side of the equation never gets any press has to do with the industry's long standing defensive posture towards consumer privacy. Any hint of consumer information gathering makes users twitch and advertisers and technology providers go running for cover. However, this is something that must occur in order for ads to be more relevant though it must be done responsibly. Search has not been plagued by the same privacy issues as display, and this is where the display industry has a lot to learn. If you provide incremental value to consumers, real value, then they'll be less wary about telling you something about themselves. Large agencies recognize that online advertising is moving towards data-driven media buying, targeting, and optimization. They also understand that whoever controls the data used in these transactions controls the power in the online advertising ecosystem. The trend towards data-driven media transactions poses a significant threat to one of the most profitable agency revenue streams, media buying. As a result, agencies are looking for ways to control this data and prevent themselves from being crossed out of the equation. Agencies are building out data warehouses that will store data from many disparate sources including online advertising and web analytics systems. Using this data and their own data insights technologies agencies plan to be the engines of data-driven media buying and improve media transactions for their clients. Increasing ad relevance is by no means a simple task. It requires all parties to take a major stake in the solution, this is probably the main reason why it has stumbled and stuttered for so long. Publishers need to make their inventory accessible in a granular and normalized fashion. They'll have to get out of the mindset of segmenting and selling their inventory based on sections of their site and start selling it based on intangible information known only to the advertiser. Increased relevance is one of the only ways to save publishers from falling CPMs and low inventory sale ratios so they must jump on board. Advertisers will have to start tracking consumer behavior on their own websites, and hopefully on others, and intelligently analyse these consumers so they know which offer will be best for each. Technology provides must provide seamlessly integrated systems that provide enormous reach, individual impression buying, and are trivial to use for all advertisers. None of these pieces are completely in place as of now, howver increased relevance in the ad display industry is something that I believe we can all look forward to in the future. Many of you may already know that I believe cable television companies are heading to the slaughter house. The number of entertainment and video distribution substitutes that are popping up on an almost monthly basis is hard to keep up with. There are many other reasons why I think their business is in trouble, but I wouldn't dive into those right now. While doing my nightly industry reading I came across an interesting article in the economist that talks about Time Warner's plans to save cable television. The action plan included Time Warner spinning off its cable operations business which already happened in March, trimming its film production business, and kicking AOL to the curb. 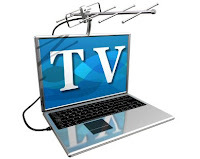 Even more interesting, the plan also called for testing a scheme to put cable programming online via what they're calling TV Everywhere - an interesting choice of name since TV is practically everywhere already. This strategy shouldn't come as a surprise. Video content providers like Time Warner have paid close attention to what has happened to the music and newspaper industries and plan to avoid their mistakes. Specifically regarding the music industry, Time Warner plans to give their customers what they want instead of standing in their way. Something the music industry failed to do then had to watch as their customers turned into pirates and cannibalized their industry. The article seems to suggest that the mistake of the newspaper industry was in giving customers too much content for free initially and now they are unable to charge for it. Further, they suggest one major concern of the content providers is that the brands they have spent so much time and energy building offline, like CNN, will be devalued if distributed via current online distribution channels like Hulu. Unlike TV advertising "Hulu does not sell advertising on specific shows or networks; rather, it targets demographic groups". This is the fundamental problem of old media's transition to online. In old media, magazines/newspapers/TV, advertisers will pay a premium to be placed on a particular page of a publication or injected into a particular TV show. The more "premium" the content the more advertisers are willing to pay. In the world of online media the concept of premium content is much different. In the highly measurable, finitely trackable world of online advertising premium content is really any content that drives conversions for an advertiser. What that means is the notion that advertisers will pay higher CPMs to run advertising on Time Warner's content just because it has a great brand doesn't necessarily hold water online. Any advertiser with half a brain is looking directly at the ROI. Whether the conversion comes from user generated content on YouTube or a home video on myfirstblog.com all that matters to the advertiser is that they got the conversion. Hulu understands this and is building out targeting options and sales packages that cater to this advertiser demand. Time Warner, as has many old media companies making the online transition, can't quite wrap their heads around this phenomenon just yet. It will take them a while, and hopefully they wouldn't make a complete mess of things by creating distribution silos or putting up too many digital fences. This month iProspect, a search marketing company, released a study about how display campaigns and search campaigns are integrated. The study highlighted, among other things, the need to include a solid search campaign with any online media effort. Not a very surprising conclusion considering that iProspect makes money from managing search campaigns, but the study did put numbers around what many of us in the industry have known all along. That is, running a display campaign without a fully integrated search campaign is like leaving money on the online ad revenue table. Further, a savy competitor who recognizes this error can lucratively capitalize on your mistake. 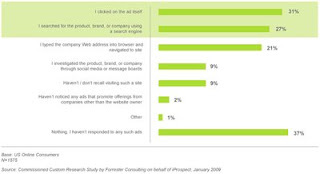 The study proclaims that 38% of internet users who respond to an online display advertising campaign eventually perform a search on the company, product, or service in question. The study also concludes that "almost as many Internet users respond to online display advertising by performing a search on a search engine (27%) as those who simply click on the ad itself (31%)". This means that your display campaigns not only generate traffic directly to your website via ad clicks, but a significant percentage of your potential customers find their way down the search funnel as well. As I have mentioned in previous posts, search does not generate demand it is merely a stream of demand which you can capture with the right funnel. The only way to capture that demand is to have a horse in the race, i.e. an active search marketing campaign. This becomes more important when you are the one generating the demand via your display campaigns. If you don't have a search campaign in place while you are running your display campaigns then you're just generating demand for your competitors to exploit, and they will. The study also claims that 38% of online display advertising respondents learn about the brand for the first time during the initial display exposure. This is great news for those who believe that they can build their brand with onlie ads and an even greater reason to couple the display campaign with a search campaign. Why? Because those respondents wouldn't have any loyalty to your brand at the time of exposure, even though they are interested in your product or service. So if a significant percentage of them decide to search for your product or service instead of clicking on your ad your competitors will have an ideal opportunity to steal them away. Whether or not you choose to believe the numbers, my gut tells me they are in range, the conclusions cannot be ignored. There can be no display without search and, for those who have unfamiliar brands, no search without display either. Read the full report and executive summary here. If you've read enough of my posts you would know that I am not necessarily a fan of the big media establishments. Call me a nonconformist if you like, but I do have my reasons. My biggest beef with the media titans is the constant use of their position to push their own social and political agendas. Today I have a nice shinny example to show you. Earlier this week the Amazon Kindle DX was revealed to the world and hailed as a revolution in media distribution which could potentially save the dying newspaper and publishing industry. While some newspapers may be excited by the Kindle DX some are clearly not. On Thursday, May 7th the NY Times Media and Advertising section had as its front page article a story of how the new Kindle DX couldn't clearly pronounce the president's name. "if the Kindle, which not only displays the news but also speaks it with a computerized voice, is ever to be the savior of print media, it needs to bone up on its pronunciation", wrote Time Arango the article's author. The NY Times is certainly not on the level of the NY Post when it comes to bias reporting, but this article could leave readers thinking otherwise. For the NY Times to put a story about the phonetic inabilities of a digital device on their front page seems laughable. However, when you consider the device in question it becomes clear that the NY Times must have a bone to pick with Amazon. It's not Amazon's fault that the media industry has failed to innovate for so many decades. Neither can you blame them for seeing and acting on a profitable need that must be met. Like most big media companies the NY Times initial reaction to technological innovation in their industry is wary jest. I recommend instead embracing the change and riding it for all it's worth. After all, what do you have to loose that you're not loosing already?